Make better Web Pages, use ckRGB! Designing Web Pages one often wants to copy colors from an example. ckRGB is a very handy tools to do this. 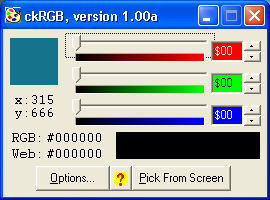 The program is a "Color Picker", it picks colors from the screen and shows the Haxadecimal value of the Color Value and the "Web Save" value of the color. The color may be easily adjusted with three controls. Click, after starting of ckRGB, the button "Pick From Screen". The button will grayed and the title bar changes; It now reads "Picking Singel Pixel". (See right picture). Now move the mouse. As you will see, the color at the place of the mouse cursor is copied to the color pane at the top left side of the program window. Now click on a color you like. The selected color is copied to the panes at the right bottom of the program screen. 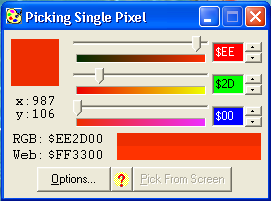 Left of these panes are the Hexadecimal RGB values of the selected colors; top value: the exacte color value, bottom value: the nearest "Web save" color value. Now move the controls to adjust the color to the color you want to get. These controls enable you to adjust the Red, the Green and the Blue components of the color. The Hexadecimal values of the color components are at the right side of the controls. At the left side og the program window, below the color pane are the screen co�rdinates of the mouse cursor. Select this item to copy the color of one pixel. 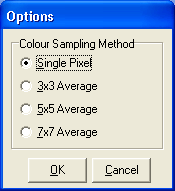 Select this item to copy the average color of a pane of three by three pixels. Select this item to copy the average color of a pane of five by five pixels. Select this item to copy the average color of a pane of seven by seven pixels. ckRGB is freely available. When you have questions or suggestions don't hessitate to send them to by mail. Give the program to you friends and family! The program is free. You can try the program without any risc; It can be easily removed again from your computer ("Start | Configuration Screen | Software | ckRGB" => Click the button "Remove"). Use this method if you want to install Birthday on a second computer or give the demo to your friends. Enter e.g. "c:\Temp" for destination. Click "OK" and downloading starts. The file ckrgb100.exe" will now be saved to the directory "c:\Temp". Now follow the instructions of the setup program to install ckRGB on your computer. Something to tell? Send an e-mail please.